Are Pomegranates Good for Children? The pomegranate is a fruit that is often known as a “superfood” thanks to its high antioxidant content. Originally native to Iran, the fruit is similar in dimension to a medium-sized orange, but has reddish-pink, leathery skin. Inside the pomegranate are hundreds of small translucent sacs, which are also called seeds, filled with red, or sometimes pink, juice. These sacs are the only edible part of the pomegranate. Given a pomegranate's highly healthful properties and low calories, you should aim to include the fruit in your child’s diet. Most kids will be attracted by the bright color of the seeds and enjoy their sweet-tart taste. Pomegranates are rich in vitamins and minerals, particularly vitamins C and E. These two vitamins are powerful antioxidants that help expel free radicals, unstable oxygen molecules that attack healthy tissues, from the body. The fruit is also high in fiber, potassium, iron and folate, a water-soluble B-complex vitamin. The high nutritional content in pomegranates gives numerous health benefits to the consumer. The antioxidants in pomegranates may help prevent a variety of diseases and illnesses, including cardiovascular disease, cancer and high blood pressure. In addition, the B-vitamin folate in pomegranates aids the healthy growth of red blood cells and promotes good blood circulation. You can offer pomegranate seeds to your kids in a number of ways. Sprinkle the seeds over yogurt or in a salad, for extra flavor or crunch. You can also make pomegranate juice by crushing a cup or two of the seeds in a blender, and then straining the resulting juice with cheesecloth. They can drink the juice straight or you can include it in a fruit smoothie. You can also give them the seeds plain -- in a bowl with a spoon. Little kids may enjoy eating the seeds as they pick them from the fruit with their fingers. Just be sure to dress them appropriately: pomegranate juice stains. 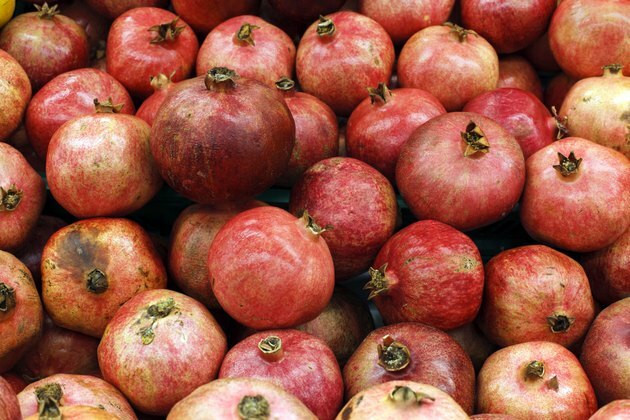 Removing the seeds from pomegranates doesn’t have to be a messy, frustrating experience. The California Pomegranate Council recommends cutting the crown off of the pomegranate, slicing the fruit into sections, then submerging the sections in a bowl of water. With your fingers, roll the seeds from the fleshy interior. Scoop up the seeds from the water with a slotted spoon or strainer, and they’re ready to eat. Can You Eat a Pomegranate Seed?